I've been itching to get out my slow cooker, so today was perfect for this opportunity. A thick fog blanketed us this morning, nothing but greyness and dampness, after an evening of downpours followed by soaking, soft drizzle into the small hours of the morning. These weather conditions actually excite me for 2 reasons. First of all the gloominess outside calls for cozy wood fires to be lit inside, with the aromas of slow cooked spicy food wafting in and out of every room. Secondly, and most exciting of the two, is it's nearly mushroom time, and with the drenching received on Friday night, followed by a beautiful sunny day (after the fog had lifted), I'm off in search of the elusive mushy tomorrow. Maybe I'll be lucky, maybe not. This dish is extremely simple, as are all slow cooker dishes. Dump the ingredients into the pot, turn it on and walk away. This meal is done in 4 hours total and simple in flavour but tasty. Next time I would perhaps add some extra Thai ingredients such as kaffir lime leaves and a touch of lemon grass. The possibilities are endless. And maybe a sprinkle of chopped coriander, rather than the basil leaves (which aren't visible in the photo). Heat 1 tablespoon oil in a large frying pan over medium-high heat. Cook chicken, in batches, for 1 to 2 minutes each side or until golden. Transfer to slow cooker. Reduce frying pan heat to low. Add remaining oil to pan. Add curry paste and cook, stirring, for 1 to 2 minutes or until aromatic. Add stock and stir until curry paste has dissolved. Add mushroom and bamboo shoots. Pour mixture over chicken and stir to combine. Cover and cook on HIGH for 3 1/2 hours. Combine fish sauce, sugar and coconut milk in a jug. Stir into curry. Cover and cook on HIGH for a further 30 minutes. Stir in basil. 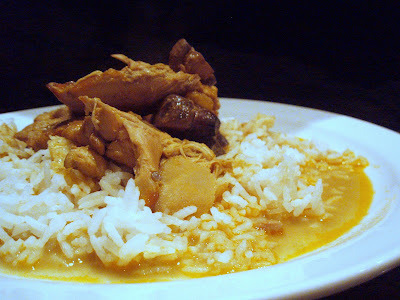 Spoon curry over rice. Serve. Kalyn's Weekend Herb Blogging has arrived in Australia this week and Anh, of Food Lovers Journey, from Melbourne will be the kind hostess. 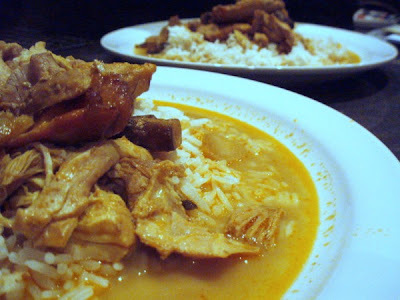 Be sure to visit her beautiful blog full of lots of Vietnamese inspired recipes and great photos. Sounds wonderful. This is one thing I nearly always order if I'm in a Thai restaurant. Hi Kalyn, although the final dish looks quite bland and boring, it is really very tasty and Thai-riffic. I have made this a few times now and LOVE it. It's just a little effort for my math-challenged brain to do the metric conversions! Thanks for hosting about method of chicken and if people follow this method,every one will get sweet and good looking chicken and I used other method from cook book but it did not become sweet and your method easy to understand.Thanks again for delightful information here. I made similar to this but it curdled or separated in the slow cooker. I put it on low only. Where did I go wrong? Can it be "uncurdled"? I'm not a chef, a baker or even a great cook. I have a new found love for food and cooking, with very little time to pursue this passion. Right now I'm in my "dough" phase, and the self imposed challenge of artisan bread baking has been put in my banneton. You're never too old to learn; it might take a bit longer, but the rewards are priceless. Fancy a bit o' crumpet?